MR. MUSEVENI, WE NEED TO SEE JUSTICE IN UGANDA, WHAT JUSTICE FOR NKEJE ? Nkeje was brutally murdered as he drove to work early on the morning of November 11, 2010. If the Uganda Police force were serious on this case, the killers of Nkeje would by now be facing the courts of law. After Nkejje was killed, the locals saw the vehicle and some say the vehicle is believed to have stayed around Bwebajja, surely, the little i have heard about this case has been simply to make the relatives of Nkejje to resign about the whole issue. It is sad, meanwhile the few put to justice like Koocky are being given pardon they don't deserve. Mr President Sir, can the police do better work? We hear a lot about the training, why can they not deliver on such cases? Hopefully, one day we shall know the motive of the people who killed Nkejje a very hardworking man who was pursuing his Ph D.
The main message during the burial of Gyagenda was, “Don’t take us into temptation, but deliver us from the devil. The preacher appealed to the family of the deceased not to be tempted into seeking revenge but to pray to God to recover from the shock, vacuum, etc as a result of the tragic death of their dear one. The devil was the motive and drive behind the murder of the Late Jonathan. Here is a man who was on their ‘family farm in Maddu Gomba’ employing 80 people. The future of these is not sure. The Late left children all still at school and these all need fees to see them successful through school life. The arms in hands of people, which arms are easily used to terminate the lives of the people in Uganda is a great unfortunate making of the NRM Government. Dr. Gombya the brother to the deceased stood up to talk to the mourners. At the start of his communication, he told us that he initially was not on the list of the people to talk. The murder of his brother had thrown him far, he only housed tears. His message as read for him by his wife had much to reflect on, “there is time for each and everything; including death.” This type of incident doesn’t induce people to work in Uganda. There is no security. I had opportunity to be shown around the site where the assailants waited for the late, you could easily see the bit of bush near the road where they shot him through the metal of the door of his car! The big turn up at the burial was a sign of concern about the insecurity and many of the developments that we are going through now partly as a result of the NRM entrenching its leadership on to Ugandans simply because they fought! As I watched the Late Gyagenda’s farewell, what came to my mind was that I may be one of those who are next on the list, and indeed these days when I hear gun shots nearly every night near where I reside, I imagine that may be I am being warned. It surprises that some body shoots a big gun over and over and you wonder what the motive is. I for one, I think it is good enough to die having told the people of Uganda the truth. And I pray that the good Lord gives me the courage. COULD GYAGENDA’S ROLE IN AUDITING THE US $34.0M (IDA) LOAN HAVE CAUSED HIS DEATH? 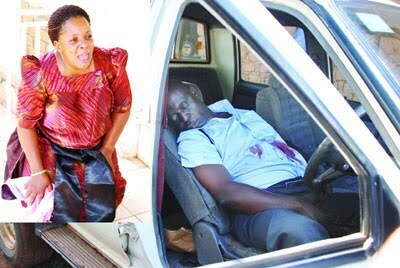 Thursday 11 November 2010, Jonathan Gyagenda met his untimely death as he executed his regular routine of traveling early to beat the infamous Kampala traffic jams all due to the lack of serious planning by the NRM Government. Auditors are endangered species as they operate in an environment where corruption is official! Gyagenda is quoted in Bukedde newspaper as an employee of Ministry of Health because of his role in auditing the above project. This project may be a real scandal on the part of the NRM Government for which among others the voters should pin down the NRM Government. If what is quoted below regarding the project is right, then as one who had a role in its auditing as is alleged, may be some people could have eliminated him for that reason. As this type of things happen, the NRM is able to spend big money whose source remains very unclear. On the President’s rallies, one is able to see yellow every where, we are told that commercial motor cyclists in Kampala are paid not less than shs 20,000 for fuel to participate. This culture which the NRM has brought into Uganda politics is very unfortunate and regrettable. Many of us have one prayer; that the good Lord who gave Museveni the passport to get to power in 1986, helps us to tame his excesses for a country badly in debt with poverty at the levels it has reached, the future is simply dark. The members of Uganda Debt Network are concerned that The Nutrition and Early Childhood Development Project (1998 – 2003), US$34.0million had not benefited the Children of Uganda. iii. We are concerned that the failure of a project of such magnitude to bear noticeable impact is a cause of concern to all persons in Uganda interested in the plight and predicament of the poor. iv. We are disheartened by the fact that it is the poor who ultimately must pay back the colossal sums of money borrowed from the World Bank. We have also learnt that with disdain that in fact The World Bank is committing another US$100million to extend the lifespan of the project inspite of the overwhelming evidence to the current project failure! St. Mary's College Kisubi is honoured to host the 57th Birthday of His Highness King Ronald Muwenda Mutebi II at the great College. "Long Live King Ronald Mutebi II"
The Community of St. Mary's College Kisubi cordially welcomes Buganda's Queen - Nabagereka Sylvia Naginda on the occasion to mark the 57th Birthday Anniversary of His Highness King Ronald Muwenda Mutebi II at the beautiful campus. To be the leading school in Uganda producing quality citizens of high morals. To pursue excellent education with Christian values bringing forth professionally focused and principled citizens for the development of society. On June 29, 1906 Father Raux Modeste was appointed headmaster of St. Mary's School and became its founder at Lubaga campus. In 1922, the school was named St. Mary's College after it started training in commercial aspects geared to employment. On 4th May 1924, St. Mary's College was transferred to Kisubi, the commissioning was done by Bishop Forbes. 1 BROTHER CHARLES MONUMENT AT Mt ST THERESA - Brother Charles Jules was the 1st Brother Headmaster of St. Mary's College Kisubi (SMACK) from 4th August 1926 ending the 20 years of the administration of the White Fathers. In 1936 SMACK registered the 1st class of Cambridge School Certificate (CSC)s 3 year course then. August 19, 1956 when SMACK celebrated its Golden Jubilee (50 years) - Governor Cohen granted the Higher School Certificate (HSC) status to the College after the Executive Committee of St. Mary's Old Boys Association (SMOBA) discussed the matter when they had an appointment with him at a time when the Late J C Kiwanuka was the Association Chairman. In 1964, St. Mary's College Kisubi became a Sports power, unfortunately the same year, on November 14, 1964, victory brought tears to the school when students returning from a Buganda Senior Cup were mistaken for political agitators, hence came face to face with untimely death in a tragic accident which claimed 12 students , 12 miles along Entebbe Highway. The match had been between St. Mary's College Kisubi and St. Henry's College which had ended in a 2 - 1 victory for SMACK. The leadership of the White Brothers of Christian Instruction ended after 43 years in 1969. During their time, the school grew from strength to strength. It exhibited academic prowess and used to have a Lion's share of scholarships awarded by the Colonial Government. The White Brothers did not only concentrate on academics, they ventured into construction work, and the architectural wonders at the College are their brainchild. They spearheaded innovations, which saw the College emerge a Sports Power House. Students were trained in various skills, which among others included Cadet - ship, Boxing, Swimming, to mention a few. Brother Anthony Joseph Kyemwa was appointed the 1st African Headmaster of St. Mary's College Kisubi, ending the 43 year era of the White Brothers, he took office with the challenge to uphold the school standards. SMACK BANANA PLANTATION ALONG SMACK 75 ROAD - SMACK students enjoy locally grown Banana's at least on the weekends when harvest is done from the school banana garden. 5 SOME SMACK HOUSES ALONG SMACK 75 ROAD - Some of the Staff houses along SMACK 75 Road. Brother Joseph Tinkasimire was appointed Headmaster from January 1987 to May 1996. During the time, President Museveni visited the school more than once and also supported the school financially. It is during Brother Tinka's time that (Sisters) were admitted to the school for HSC, hence they form the OG's of SMACK. On Tuesday February 4, 1992 Emmanuel Cardinal Wamala survived death after he had been kidnapped by Bingo, an ordeal which lasted for 21 hours from Monday 3rd, February 1992. The archdiocese of Kampala owns SMACK, hence the Archbishop is the top most authority of the school. Prof. Kyalwazi's Funeral Service at Lubaga Cathedral was the 1st function Cardinal Wamala presided over after captivity. In recognition of the services of Prof. Kyalwazi to Uganda, President Museveni declared a day of National Mourning on the day of his burial, and the entire cabinet attended his funeral service. Kyalwazi was the 1st catholic Doctor in Uganda to receive a fellowship of the Royal College of Surgeons (FRCS), the 1st African Doctor to obtain the qualification south of the Sahara. Prof. Kyalwazi was the 1st African to become President of East African Association of the Surgeons. He was Chairman of the Board of Governors of St. mary's College Kisubi till his death, he was an Old Boy of SMACK and Chairman of the Old Boy's Association around 1964 and 1965. Former Brother and now Mr. John Agaba was Headmaster from 1996 - 1998. During his time the Decade of development was launched at the school on October 5, 1997 which paved way for the SMACK Centenary Celebrations in 2006. Brother Edward Bukenya from (1998 to-date). he continued on with the Decade of Development and thereafter, the successful celebration of the SMACK Centenary in 2006. His time has see a lot of modifications and modernization at the school. It is during his time that Engineer J B Walusimbi Jr)Chairman of the Board of Governors was chosen by Kabaka Mutebi to take up the position of Katikiiro of Buganda. Walusimbi has been given a second 4 year term as Katikiiro of Buganda. WHAT USED TO BE THE ONLY CANTEEN (BY KAWEESA) IN THE 1970'S AS WELL AS ACCOMMODATED THE FIREWOOD KITCHEN, HAS BEEN MODIFIED TO ACCOMMODATE NON TEACHING STAFF AT SMACK. THE LEGION OF MARY SIGN POST WELCOMES YOU TO SMACK MAIN GATE. A FORMER VISITOR'S ROOM IN THE 1970'S THEN CANTEEN IS NOW A DINING FOR GROUP EMPLOYEES AT THE SCHOOL. THE FRONT VIEW OF THE NEW DINING HALL WHICH HAS THE ABILITY TO HAVE ALL STUDENTS GO FOR LUNCH AT THE SAME TIME. ON 27TH MARCH 2011, MONSIGNOR CHARLES KASIBANTE ( A FORMER CHAPLAIN AND BIOLOGY TEACHER AT SMACK)OFFICIALLY OPENED THE NEW DINING HALL. THE CANTEEN AT THE NEW DINING HALL IS AS IF A GROCERY OF SORTS - IT IS REALLY MODERN AND BOYS ARE PROUD OF IT. INSIDE THE NEW DINING HALL WITH TV SCREEN IN VIEW ( THERE SCREENS IN FRONT AND AT THE BACK OF THE TWO FLOORS). BACK VIEW OF THE NEWLY OPENED DINING HALL AT SMACK. THE GERMAN CLASS ROOM WHICH IS STILL RELATIVELY NEW. THE GATE TO THE DORMITORY AREA AT SMACK. IN THE 1970'S AND BEFORE, VEHICLES USED TO ENTER THIS AREA, TODAY IT IS OUT OF BOUNDS. THE DORMITORY AREA AT SMACK. THE STATUE OF THE VIRGIN MARY AS PUT UP BY BROTHER ANTHONY KYEMWA WHEN HE WAS STILL A STUDENT AT MAKERERE UNIVERSITY - IT IS IN THE HEART OT THE DORMITORY AREA. ONE END OF THE CENTENARY HSC DORMITORY BUILDING. THE SMACK EAGLES WORKED ON BY BROTHER ANTHONY KYEMWA AND SMACK BOYS PRIOR TO 2006 CENTENARY CELEBRATIONS. PART OF THE MAIN BUILDING AT SMACK. THE SMACK 1973 O'LEVEL KITUUKA CLASS. SMACK 1973 A' LEVEL (HSC ) CLASS. THE SMACK 1973 EACE CLASS. THE SMACK 1960 CSC CLASS. THE SMACK 1961 CSC CLASS. THE SMACK 1962 CSC CLASS. THE SMACK 1964 CSC CLASS. THE SMACK 1965 CSC CLASS. THE SMACK 1970 EACE CLASS. THE SMACK 1972 HSC CLASS. THE SMACK 1967 HSC CLASS. CAN YOU IDENTIFY THE IGP KAIHURA? THAT WAS HIS HSC CLASS AT SMACK. INTER - HOUSE COMPETITION SCORE BOARDS INITIATED BY BROTHER ANTHONY KYEMWA WHEN HE WAS HEADMASTER. THE LONG SERVING LIBRARIAN AT SMACK - MR. KIBUUKA. THE SWIMMING POOL PROJECT ABOUT TO BE COMPLETED, IT IS THE PUMP WHICH IS YET TO BE FIXED. THE BURIAL GROUNDS FOR THE DEAD BROTHERS OF CHRISTIAN INSTRUCTION. IN THE 1970'S AND 80'S STUDENTS USED TO TAKE GROUP PHOTOS AT THIS MONUMENT. FORMER PLAY GROUND AT Mt THERESA HAS SCIENCE BLOCK FOR UNIVERSITY - BUILDINGS HAVE EATEN THE PLAY GROUND. THE POSTAL OFFICE - HAS LITTLE BUSINESS COMPARED TO THE 1980'S AND BEFORE. WHAT SOLUTION TO AFRICAN DICTATORS?